It’s hard to pick a single winner of the early Wire 7inches. But if I have too I’ll pick this and Outdoor Minor. For some strange reason this 1978 release seems to be the tuffest to find of them all especially with sleeve. How come? 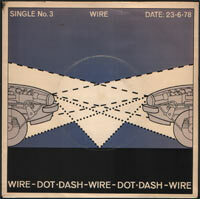 So why do I put up songs with such a known band as Wire? Cause in my opinion Wire is criminally underrated among the big masses of punk consumers. Remember this kids: there was a time when each and every band strived to sound unique and Wire is a good example of that era. Listen and learn. You hit the nail right on the head with every word! When I was younger, I used to find WIRE’s “pink flag” boring and thought the Minor Threat version of “12XU” was better than theirs (haha) until I realised how incredibly great and original in every little bit WIRE’s first two LPs were. Definately made for eternity! I have been looking unsuccessfully for the Wire single Our Swimmer/Midnight Banhoff Cafe. I don’t think it’s on any of their CD’s. It would be awesome if you have it and can post it here! You’re welcome Matt though I wish you where here so you could thank me in a more “personal” way. You know what I mean *nudge* *nudge*. Wire were totally amazing. Pink Flag is a total classic punk album and I am the Fly was one of their best singles. Check out the Live at the Roxy album for their awesome version of 12xu. You got a really great site here. Does anyone know how much this 7″ is worth? I’m building my catalog and I can’t really find much info on it. cheers. It´s a fantastic record but relatively easy to find though I´ve found it to be among the hardest to find among the early Wire 7″s. You can find for about 10 dollars on eBay.